After applying for months, the call you’ve been waiting to hear has finally reached your phone—a job interview invitation. You feel excited until you learn that the interview is on the day after tomorrow! You only have two days to prepare but don’t panic because Best10ResumeWriters got your back. Complete with proper timing and tactic, here’s a 48-hour job interview preparation checklist to help you ace your big day. Finally got invited for a job interview but it is happening in two days? 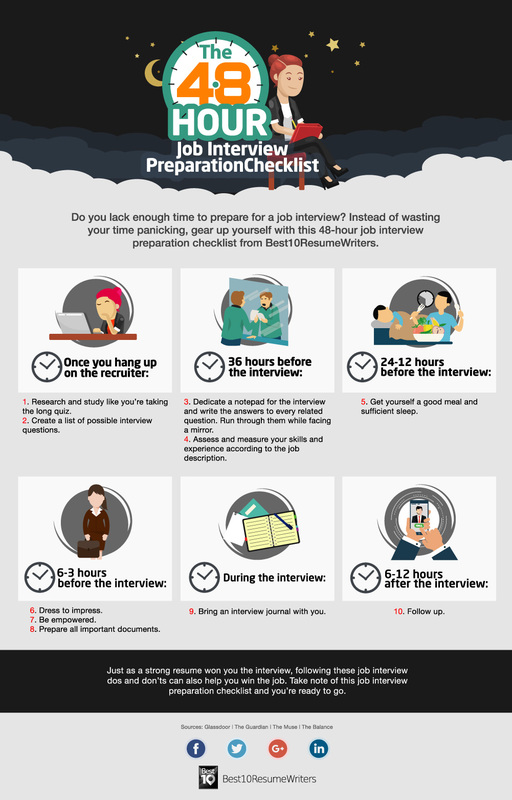 Instead of wasting your time panicking, ready and gear up yourself with the help of this 48-hour job interview preparation checklist. 1. Research and study like you’re preparing for a long quiz. – Examine every detail about the company and memorize them by heart. – If you’re eyeing for a certain position, review its description, and all relevant terms and news that the interviewer might ask. 2. Create a list of possible interview questions. – Compile all questions based on what you expect them to ask and from the work experiences of others who worked in similar firms and position. 3. Dedicate a notepad for the interview and write the answers to every related question. Run through them while facing a mirror. – Instead of memorizing the answers verbatimly, it’s easier to use and remember key points and phrases. – Also, prepare your own questions and be ready to ask the interviewer when you could or given the chance. 4. Assess and measure your skills and experience according to the job description. – Evaluate your skills and experience based on every component under the job description and ponder over how you want to present them. – If they are seeking a quality that you don’t possess, expound on how you will still be productive without it. 5. Get yourself a good meal and sounding sleep. – Eat, relax, and sleep well for the interview. This way, you’ll appear fresh. Your mind is sharp and prepared to respond even to the inevitable questions. – Feel and look good. Make sure that your attire is well-groomed and appropriate. – Remember to handshake, keep a flamboyant posture, and maintain an attentive body language so you won’t look too nervous and timid. 8. Prepare all the important documents. – Plan and anticipate everything ahead so there’s no room for the forgotten IDs, files, or resume. 9. Bring an interview journal with you. – During or right after your interview, jot down the parts that you think you aced or missed. These will serve as a valuable guide to better yourself for your future interviews. – Extending the conversation shows your interest and commitment to the job. But instead of calling every day, sending a simple thank you note via email can speak volumes about your commitment. Just as a strong resume won you the interview, following these job interview dos and don’ts can also help you win the job. Keep in mind this job interview preparation checklist and you’re ready to go. Click here to view a larger version or to download a copy of this infographic. For more tips on how to prepare for a job interview, you can browse through our resources page.